Researchers at the U.S. National Toxicology Program (NTP), a federal inter-agency group under the National Institutes of Health, led the study that took 17 years to complete from the time it was mandated by the FDA. They exposed rats to carefully calibrated radio-frequency (RF) radiation levels designed to roughly emulate what people today experience in their daily lives. The rodents were placed in specially built chambers that dosed them with varying amounts and types of this RF radiation for approximately nine hours per day throughout their two-year lifespans. 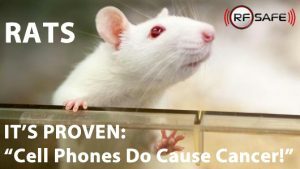 The research studied rats to determine whether the radio-frequency (RF) radiation emitted by mobile phones can cause cancer. To do so, the study started with pregnant rats that were placed in special chambers. Once their pups were born, they were treated with RF radiation for approximately nine hours per day. “All RF exposures were conducted over a period of approximately 18 hours using a continuous cycle of 10 minutes on (exposed) and 10 minutes off (not exposed), for a total daily exposure time of approximately 9 hours a day, 7 days/week,”the official pdf Doc from the early release findings states. The International Agency for Research on Cancer in 2011 classified RF radiation as a possible human carcinogen. However, lobbyist have been able to keep this issue swept under the carpet throughout most of the United States and the world. Berkeley CA did manage to pass a watered down version of their intended cell phone radiation warning which is currently a legally binding city ordinance that forces cell phone stores to inform customers of today’s well-understood risk from smartphone radiation exposure. The wheels for this study started in 1999 when the FDA nominates RF from wireless devices for testing by the U.S. National Toxicology Program. In 2001 the NTP decides to sponsor RF–cancer studies and in 2003 the NTP solicits its first proposals for RF–cancer experiments and later again in 2004 solicits the second round of proposals for RF–cancer experiments. Moving forward slowly, in 2005 the NTP signs a contract with IITRI in Chicago to carry out RF exposure testing — It took another two years, 2007 before exposure systems made by IT’IS were installed at the IITRI facility. Before the study ever began, the lead investigator Ron Melnick retired in 2009, and Michael Wyde takes over the NTP RF Animal Project. Finally five years later, no rush here, it’s only 6 billion lives at stake — the 2014-15 RF exposures of the two-year studies are completed. Now, 2016 the results are in! It took 17 years to do a 2-year study impeded by bureaucratic constraints posed by lobbyists which have taken total control over the FCC. The peer-reviewed study, by the National Toxicology Program, found an increase in two types of tumors in male rats that were exposed to the type of radio frequencies that are commonly emitted by cellphones. The tumors were gliomas, which are in the glial cells of the brain, and schwannomas of the heart. “Importantly, the exposed rats were found to have higher rates of two types of cancers:glioma, a tumor of the glial cells in the brain, and malignant schwannoma of the heart, a very rare tumor. None of the unexposed control rats developed either type of tumor. National Toxicology Program’s $25 million study is one of the biggest and most comprehensive experiments into health effects from cell phones.